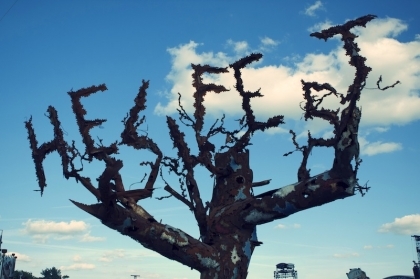 HELLFEST OPEN AIR has reached a decade this year and we didn’t want to miss it. To celebrate it, the festival has spread a memorable set of bands such as Motörhead, Judas Priest, Slash, Scorpions, Mayhem, Slipknot or Lamb of God among others, as well as many improvements we have all thanked. Just a few kilometres from Jules Verne’s place of birth, and close to the beach where the Normandy disembark took place seventy years ago, the village of Clisson opens its doors to more than 20.000 people from everywhere in the globe. The atmosphere was one to remember and the weather was great, despite the hours of vertical sun, which dried us all. After dribbling around the packed entrance, we accredited ourselves and went straight to the camping zone, which is the hall and after hour of any festival, where everyone celebrates music and shares the hangover. After a long nap and reviewing the running order, we take a walk through the Extreme Market, the merch’s Disneyland where one can find anything metal related, from baby metal clothes to long, drinking horns. The Hell City Square has offered the usual services, from a free hairdresser, a tattoo shop, a sales point to buy the 2016 tickets and the mythical Dr. Marteens stand where you can custom all boots. A novelty has been the Hellfire Tavern, a bar sponsored by Blizzard (World of Warcraft) where you could play the game and see live performances. We warmed up the night at the Metal Corner, area next to the camping keen for eating, drinking, head banging and melting with the festival assistants, great atmosphere! Among the changes in the festival, we’ve seen a general paint job in the whole facility. The cathedral entrance looked better, and so did all the stages. Altar, Temple and Valley could afford more people this year and each had a screen with the band schedule, and also broadcasted each show. Moreover, the whole place has been gardened, you don’t move through a sandy, dusty desert anymore. Now one could seat down, relax and even sleep the hangover! And farewell to tokens, the new cashless card for drinks was a better choice indeed for it was not as easy to loose, and if you were generous enough when you first filled it, you would avoid the long cues for the rest of the days. Any other amusements? Yes! We could find more bar areas, a half-pipe jail, fire shows every now and then, available merch next to the main stages, more food variety… And hygiene wise they have installed more toilets, dry toilets, increased cleaning turns and trash bins everywhere. Not bad huh? To sum up, Hellfest has turned the volumes up in all senses and has become a clear reference in the European festival scene. One could jump on the big wheel and stare at these three awesome days: days of eternal fun and perpetual hangover, days to discover new bands and fulfil your dreams to see the other time missed ones; days of sonic explosion! Three days that can be summed up in three words: WE WANT MORE!